UPDATE EDIT: This Information is referenced in the Scar Sub FAQ about PIE and PIH Hyperpigmentation and Hypopigmentation - It has been posted here as a courtesy on the topic. -Aloe vera gel + honey and vitamin K (gets rid of bruises and red) keeps the spots moist creating quicker healing. You can use Emu oil or triple antibiotic cream to keep your wounds moist (Note: this breaks out some people so please spot test). In the morning you use cool water to cleanse your face. Use diluted white vinegar and pat (not rub) the face to sterilize it. Moisture with a pure 100% Hyaluronic Acid Serum, this avoids skin irritation. -Fresh lemon has helped some people fade their spots and also topical green tea. -Topical Vitamin C serum can help some fade their reds and browns and in others it has irritated their skin. Always wear sunscreen. In the morning you use cool water to cleanse your face. Use diluted white vinegar and pat (not rub) the face to sterilize it. Moisture with a pure 100% Hyaluronic Acid Serum, this avoids skin irritation. These spots can take months to heal being irritated wounds, the remnants of acne or other skin issues. Q: What can I do diet-wise to deal with my spots (red, brown, white)? A: Eliminate: sugar, dairy, gluten, start eating fermented foods and bone broths, take your probiotics, and antioxidants such as green tea, vitamin C, and niacinamide. Smoking stops healing as does too little rest. You need animal foods in your diet, especially healthy fats, so don't be afraid to eat fatty meats! If you are a vegetarian eat nuts, hummus, coconut & olive oils, Many with these spot flare-ups mixed with red hyperpigmentation have candida (yeast) and gut health issues. This might need addressing. After antibiotics, this common yeast can cause issues in the body. Q: What Is Post Inflammatory Erythema (PIE)? A: Post Inflammatory Erythema (PIE) describes pink to red discoloration after an inflammatory acne lesion. Patients with lighter skin types (I-III) the post-inflammatory dyspigmentation is often not hyperpigmentation, but instead discrete erythematous macules (PIE). Acne may not be the only cause of post inflammatory erythema, as any resolving cutaneous inflammatory process may have residual erythema. Treatments (ranked most effective to least): V-beam, or IPL, or Excel V, or 1064nm (vascular laser can help these areas quickly by making the body dissolve the trapped red blood / surface veins), steroid creams from the derm, Retin-A Cream, Bactroban cream, Silicone Sheets and topicals (known as scar gels), 2.5% hydrocortisone twice per day (only for a weeks time - it thins the skin), triple antibiotic. Some find light (%) peels helpful like Salicylic Acid or Glycolic (Acne.org has an excellent one in the store)... Your skin must not be raw, overly thin, or any allergy to aspirin (Sali) . Please do not use Scrubs, Harsh Soaps or Exfoliants that prolong the wounding. Emu Oil, Honey, Aloe Vera, and Green Tea are soothing / healing. Visine aka red reducing eye drops temporarily reduces the red and concealer (makeup), while you heal. Picosure is a great treatment (non - ablative). IF you have Ethnic Skin (Asian, Indian, Mediterranean, Black/African,etc...), it works well because you have more collagen in your skin. Works perfect for your skin type. This promotes new collagen, is a alternative to vascular laser for lighter skin types, and gets rid of the PIE. First, get your skin completely clear from active acne. 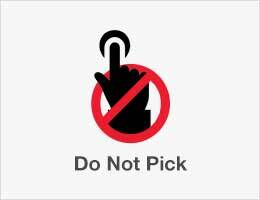 This way you are preventing any future Erythema. Once you are clear, you can try a Erythema treatment above to reduce the marks you might have. Topical treatments are the first choice for treating Erythema. The treatments most commonly prescribed by dermatologists are Steroids. Erythema is common among people of Caucasian descent. Erythema can also occur in darker skin, albeit less frequently. 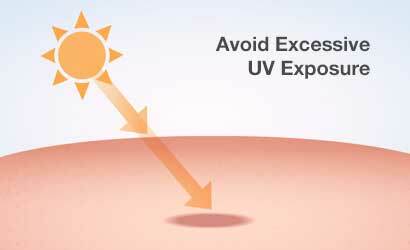 UV light – the light from the rays of the sun – can make Erythema worse and cause it to remain longer. However, it is not clear whether UV light worsens acne itself, as research studies have reported that UV radiation can both increase6 and decrease7 acne. Regardless, for all skin types, it is important to take appropriate steps to protect your skin from excessive sun in order to avoid worsening of Erythema and allow any Erythema you currently have to heal as fast as possible. The best way to prevent hyperpigmentation is to treat the acne itself, thus preventing future acne lesions and any Erythema that they might leave behind.10 Acne is treated the same regardless of skin color and responds extremely well to proper topical treatment with benzoyl peroxide. 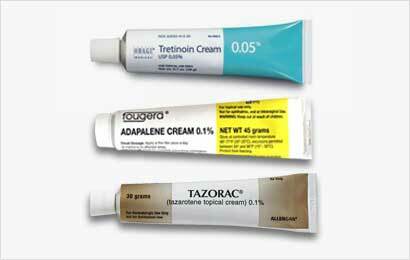 When acne is severe, widespread, and deeply scarring, Accutane (isotretinoin) is also an option. Q: What Is Post Inflammatory Hyperpigmentation (PIH)? 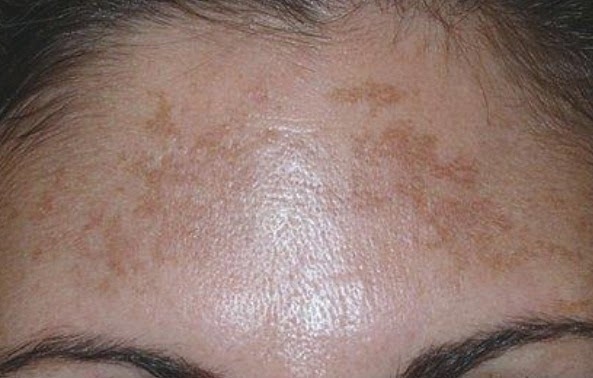 A: Post Inflammatory Hyperpigmentation (PIH) is related to brown spots, and permanent red spots. The discolorations are caused by an excess production of melanin. Vitamin C, Glycolic, Hydroquinone (skin bleaching cream) are all great tools for inhibiting melanin which will fade the discoloration. PIH is more common in darker skin types (Fitzpatrick IV-VI), although it is not limited to any skin type. Treatments ( ranked most effective to least): V-beam, or IPL/ photofacials, or Excel V, or 1064nm, or QuadroStar Pro Yellow Laser (vascular laser can help these areas quickly by making the body dissolve the trapped red blood / surface veins), Alpha Hydroxy Acid peels: glycolic * good also for smaller pores, TCA, Mandelic (Acne.org has an excellent one in the store), Skin bleaching creams (aka hydroquinone or Kojic cid w/ Arbutin), Retin-A Cream for cell turnover, Vita-K cream for Blotchy Skin . Hyperpigmentation is common among people of African, Asian, and Latino descent, as well as other forms of non-Caucasian skin.1-5 Hyperpigmentation can also occur in Caucasian skin, albeit less frequently. UV light – the light from the rays of the sun – can make hyperpigmentation worse and cause it to remain longer. However, it is not clear whether UV light worsens acne itself, as research studies have reported that UV radiation can both increase6 and decrease7 acne. Regardless, for all skin types, it is important to take appropriate steps to protect your skin from excessive sun in order to avoid worsening of hyperpigmentation and allow any hyperpigmentation you currently have to heal as fast as possible. The best way to prevent hyperpigmentation is to treat the acne itself, thus preventing future acne lesions and any hyperpigmentation that they might leave behind.10 Acne is treated the same regardless of skin color and responds extremely well to proper topical treatment with benzoyl peroxide. When acne is severe, widespread, and deeply scarring, Accutane (isotretinoin) is also an option. Hydroquinone is the first choice of treatment for hyperpigmentation.12 It is normally used at a concentration of 4%. In higher concentrations it can cause "spotted halos," which appear as lighter colored ring around marks. Hydroquinone treatment results in a marked improvement or complete clearing of PIH in 63% of the patients.4 The efficacy of hydroquinone may be increased by the addition of a retinoid and a low potency corticosteroid, such as hydrocortisone.13 Side effects of hydroquinone include burning, redness, and itching in 30% of the patients.12 The addition of ascorbic acid (Vitamin C) to a topical hydroquinone treatment may help minimize side effects.2-3 Hyperpigmentation starts to subside after 4 weeks of hydroquinone treatment, but maximum results usually require 8 to 12 weeks of treatment. Be certain to work closely with your physician or dermatologist if you decide to use hydroquinone to ensure proper dosage and reduction of side effects. Retinoids typically take 8 to 12 weeks to produce maximum results. The frequency and concentration of retinoid therapy depends on the severity of hyperpigmentation and should be determined by a dermatologist. 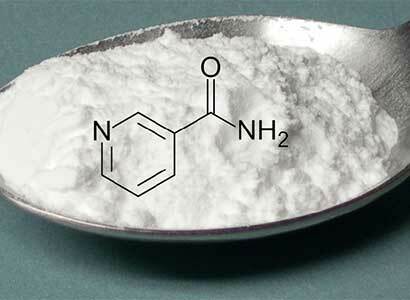 Niacinamide, also known as Nicotinamide. Niacinamide is a B vitamin that can be administered topically, and is currently being investigated as a potential therapy for hyperpigmentation. A study published in the journal Cutis in 2015 showed that a topical cream containing 4% niacinamide in combination with the other pigment-lightening and anti-inflammatory compounds arbutin, bisabolol, and retinaldehyde reduced hyperpigmentation due to melasma by 34% over a period of two months. Melasma is a common skin problem where brown marks appear on the face due to pregnancy or sun exposure.15 To date, there exists no published research that has investigated whether niacinamide is also effective in treating PIH, but studies are currently in progress. Azelaic acid is another topical acne prescription that is sometimes used for PIH that works by slowing down the production of melanin. It is a gel that doctors normally prescribe in 20% concentration for PIH, applied twice a day. Azelaic acid is safe and effective for the treatment of both acne and PIH conditions in darker skin types. 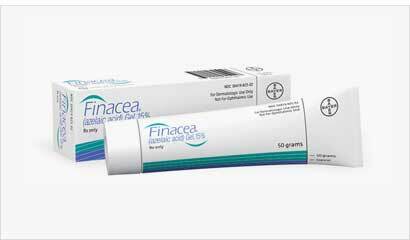 Common side effects include mild redness, scaling, and burning.16 Due to the mechanism of action of azelaic acid, results are not seen for the first few months of azelaic acid treatment, but results are eventually seen after six months. Over-the-counter glycolic acid products are available in strengths up to 10% and can provide gentler chemical “peeling,” which is better described as gentle chemical exfoliation. At lower percentages in over-the-counter products, glycolic acid does not cause the skin to visibly peel off in sheets like professionally administered chemical peels do, and instead provides exfoliation of only the surface cells of the skin. This is a slower and safer way to achieve the skin turnover required to reduce hyperpigmentation and can be used on a more frequent basis when compared to chemical peels. Most people find that they can tolerate over-the-counter 10% glycolic acid products every two or three nights, or every night when mixed ½ and ½ with moisturizer. A: Hypopigmentation is: Vitiligo, pigment loss due to burns, scars, skin discoloration. Q: How do I improve my large pores, and orange peel texture? -- Please See the Filler and Subcision Section below for a detailed description for scars. - Retin-A - Increases Skin turnover production. - BHA (Glycolic acid peels) like you find from Acne.org store above. - Paula's Choice 10% niamincide booster. Niamincide has been proven to thicken skin and shrink pores. - There is a cream called Benefit Cosmetics "Pore"fessional that blurs these spots, used as a primer under makeup or by itself. - TCA Cross using 50%, you need a very tiny way to either get into the pore and not hit the walls doing a little at a time until they heal. Some have used a broom bristle, shaved down toothpick, and tiny needle to fit inside pores or ice picks. - Filler injected throughout the cheeks not specifically for the scars (broad filling to plump the skin). - Skin Boosters help some also called Meso. This benefit does not last long before a top up is needed. This hydrates and plumps the skin a bit but will not work for all but the most shallow/ small scarring. For a larger area you can spot treat with TCA full peels (spot treatment on your scars 35% and under, start at 15% and move up, do a test spot to see how your skin reacts before going crazy). Always degrease with acetone or rubbing alcohol and a pre-peel jesner / glycolic peel before. You can do a few at a time, so you can cover with makeup. -Microneedle .05mm followed by botox to the pores superficially shrinks them. - The Most costly is a deep sedated Phenol peel, this should be your last solution if all else fails, ... the doctor must go deep enough to get under the scars. Q: Can Guys Do Anything to Cover Their spots and Help with Self Esteem? A: Guys you can be as manly as you want and wear makeup (the ladies have had this tool for some time). Hear me out. Movie stars, news anchors, models, musicians, Youtubers, and even politicians wear makeup. Buy a concealer for just your acne scars and spots (spot treat them). You want it to match exactly your skin color and not be shiny ("matte"). My favorite is sold at Sephora (they color match you) Makeup Forever Camouflage Concealer, this looks extremely natural on the spots. Dermablend is sold at Macy's and Nordstrom. This is used for medical scars and to cover tattoos (they match your color) and it's very thickly pigmented. Ben Nye Cover All Wheel and Bill Nye Concealer Wheel sold on Amazon and Ebay (it has various shades), this is used in the theater. Juwt wondering, how did you burn yourself with a tca peel? hey firstly welcome to the site i just want to say recell isnt bs at least from my research in my opinion i think it would help you, did you however ask to see any before and after pictures of these guys work what sort of improvement did they say you could expect. No before and after pics lol I asked both clinics.they said they onluly have the 4 pics on the site that look fake to me.plus I've seen this 4 pics used on other people's sites advertising miracle creams.red flag.I asked both clinics why there is zero reviews good or bad for recell they don't know.I asked if they can put me in touch with clients that had the recell .they said no as its private.they also want 1000 pounds now upfront and I have to pay 4000 pounds in 8 months to hold the appointment .yes 8 months wait with zenith as the dr is not been in the country all this time .my burn is just over a year old and still pink and blanches on pressure. It looks like it did at month 2 so zero natural improvement.When I ask how well will it work.all I get it you will get some improvement lol.wtf 5000 pounds no reviews no pics no nothing but all they say is improvement. 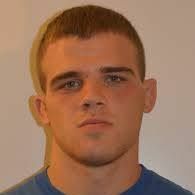 So pissed off and depressed. As far as I'm aware, what i'm about to share with you has no scientific corroboration to back the claims up, but it since you're at a point of distress, It might be worth a try! You really have nothing to loose. I can't attest as to whether the ginger phenomena works or not (that goes for the needling below too), but It seems to have helped a whole bunch of people. Check. Also, a simple google search with the keywords: 'ginger' & 'hypopigmentation' reveals a myriad of information that you may want to check out. It basically calls for rubbing ginger around the affected areas 2-3 times a day for an extended period of time. You could essentially combine these two. It might increase the ginger's therapeutic effect, i don't know? If you do decide to pursue this road, make sure you blog it! Good luck! I think you have leucoderma from the chemical burn, i see loss of pigmentation compared to the surrounding skin. The scar is still red due to the capillaries, it's still remodelling, eventually it should turn white. If you want the redness to go away faster, a pulse dye laser will help. Unfortunately the repigmentation is the bigger issue. I too have scars which i wanted to get repigmented. I tried melanocyte transfer from a piece of skin graft which not much different from how recell works and post procedure had multiple sessions of excimer laser to stimulate melanogenesis but it didn't work one bit. I am 1 week+ post treatment for scar repigmentation by autologus mini grafting where they punch out multiple 1mm size tissue from the scar and replaced it with the same no. and size of donor punch grafts of normal skin from the back of the ear. The pigment from the normal tissue is supposed to spread in a halo around it and repigment the surrounding scar tissue if i were a responder. You can read about the procedure in this study. Honestly I doubt anything will improve hypopigmentation at this time. Trying a procedure at this point is an act of desperation and a waste of money (especially if you are short on cash). Look at the study i linked regarding the punch grafts, right now the area looks polka dotted due to the grafts. Cost will depend on the area, it's actully a very easy procedure so i don't expect ethical doctors to charge you an arm or a leg. You have to do your own research to find someone who does it, very likely a dermatologist who specializes in treating vitilgo because that's what the procedure was primarily for. The other way to get melanocytes into a scar is by hair transplant because the bulge region is full of melanocytic progenitor stem cells that can migrate to the surrounding tissue and repigment the area. Read this study. The above 2 are really the most viable method i found after extensive research. I don't know of any other effective ways. If you decide to try the punch graft method, I have another suggestion which is to do a spot testing, just do a few mini grafts implanted into the scar, if there are no results, you can forget about the procedure. The key is viability of the melanocytes after transplant, by abrading the scar with laser or other methods and then putting a suspension of melanocytes (like recell) and putting a dressing over it, the scar area will not "take" the melanocytes well, the melanocytes will just die because the scar tissue is devoid of blood vessels unlike normal skin. Cheers mate I did read all the links you gave on mini graft .the polka dot effect is scarey.and I have a huge area to cover I don't think it will work on big areas.I could imagine it working on 1cm spot but not 6 inches by 7 inches of scar.I also read the link to the recell study. That also dosent seem worth 5000 pounds if I was a millionare I would try it anyway, just to be a guinne pig as no normal people other than the guys in the study have even had recell for hypo scar from burns,yes dr kahn and rawlings say they do this hypopigmentation procedure daily of tons of people.but that sounds like bs sales taktic. If there was proof recell works from real life forum members with clear documented pics .I would get into the biggest debt of my life .I would try and get 6 credit cards and have it done.I can't get it tattooed either as it's red and they can't tattoo red skin to mach my brown colour ,plus I tan really easily being half black so a tattoo will look odd when i tan and the camo tats don't look great looking online at pics. And they want over 1000 pounds lol,I want to know where these thousands of uk people who have had recell are all hiding .I'm thinking perhaps try to tan the area.as I've worn a hat daily to keep it from sun for 13 months.how would I tan it in uk it's winter lol.bimtoprost trial with dermabrasion and derma roller had amazing results in.the 10 guys.so I tried it didn't do a thing and I went hard with the roller bleeding mess.tried scar treatments also didn't do anything. It's all snake oil. Yeah Recell is a total sham I think, which is why it still isn't FDA approved. I tried bimatoprost and microneedling, didn't do a thing. Yes, i agree your affected area is large. I personally think you should avoid the sun, the normal skin around your scar will just get darker and your scar will just get redder, the contrast will just get worse. You already have been assessed for medical tattooing? I think that is really a practical alternative. hi aesthetic beast i agree with you about dr rawlins also enquired about re cell says he has done thousands of these etc which i dont dispute but when i asked to see some before and afters says he cant show me any same thing about speaking to patients its a complete waste of time and that should tell you this it isnt good because out of supposed thousands not one person has given permission it probably means none of the person is happy. Hope01 Yes recell is a scam I think just reasons being not 1 person on earth can share there results lol.I even asked the 2 clinics if I could get a discount if I have the procedure then do a big review and let them post my pics on there site etc etc they straight up told me no way.and no discount.price is strict and for the forehead and dermabrasion price starts at 5000 pounds upwards .so the price is probably. Ore than 5000 grand for forehead only.full face would be like 9 thousand pounds I assume. The part that says is one operation enough for complete recovery sounds pretty bad.it's says all patients do not recive full pigmentation in one session roughly 30 percent need to have more surgerys to get complete recovery.this could end up more expensive than recell? Read my post, this is the first treatment i tried. Scar tissue is not the same as vitiligo skin. Hope01 why did you have a consoltation with this Indian dude have you also got hypopigmentation? 150 pounds is for a consultation. It's the same as recell in every way but 3000 pounds cheaper.but the sales guy said recell is rubbish and this procedure is much better.but they are both the same procedure lol.oh and Hope01 why did he turn u away? You say he will show pics?I've asked the sales guy and he said no pics.would I have to pay for the consoltation to see the before and after pics? Also I can't find any reviews if this clinic online either or pics? 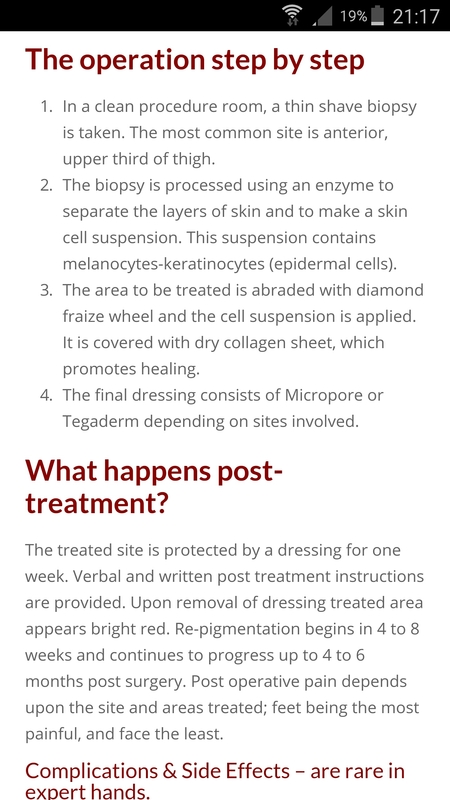 Here is a screen shot of the decription of the procedure. At this alternative clinic calling this treatment melanosite transfer instead of recell.but it's the same.what scares me is why are they saying recell dosent work but there treatment works and they are the same treatment.